Your heart is an essential part of your body’s overall health, without it you have no life. The heart is a muscle with four chambers and valves; it pumps blood and oxygen to the different parts of the body. As long as there is a constant flow with no mal-function of the circulatory system or its parts, all is well. However, should a blockage occur, a heart attack takes place. Most of us assume that everything which takes place concerning the heart is a heart attack, but that is not the case. Read on so that we might help you to understand the meaningful differences OF HEART DISEASE. Heart Attacks take place when there is a blockage in the arteries which carry the blood/oxygen. 1) Should there be fatty tissue along the artery lining; the heart pumps less of the necessary blood as the fatty tissue accumulates. This is why the doctor urges you to watch your diet and cholesterol levels. 2) Over the years this buildup restricts the normal flow of blood and often creates blood clots. Clots grow over time and at some point detach themselves from their original spot and travel through the circulatory system often to a coronary artery. This then creates the environment for a heart attack once it blocks the coronary artery. 3) Sometimes a blockage can slow down the blood flow and create arrhythmia which prevents the body from getting an adequate supply of needed blood. 4) An aneurysm ….. a weak spot in a blood vessel, can rupture and cause internal bleeding which then disrupts the flow and supply of blood needed by the body. 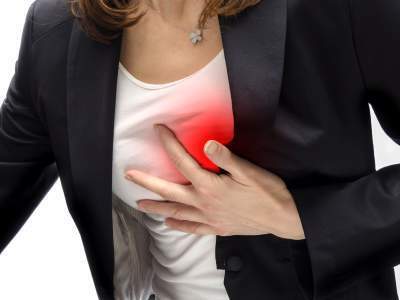 Symptoms of Heart Attack: Seek immediate emergency help! Not all heart attacks are the same, but should you experience any of these symptoms along with other problems; seek help. Time is of the essence and treatment must take place as soon as possible. Have someone call 911 while you focus on calming yourself. Other illnesses which may mimic a heart attack include gallbladder attack, fibromyalgia and heartburn/GERD. Seek help you cannot afford to take a chance, no matter which it is. 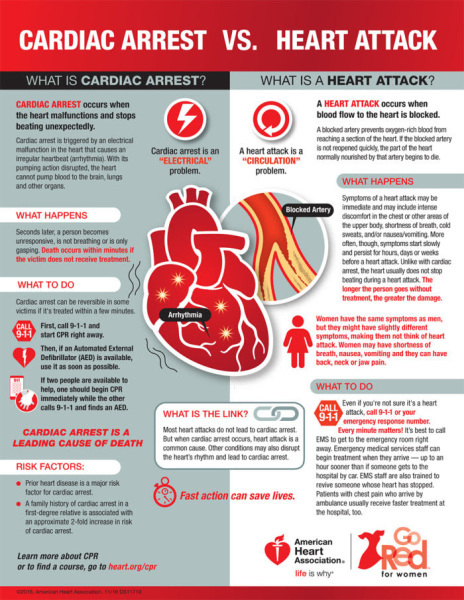 Cardiac Arrest: takes place without warning and is triggered when the electrical signals to the heart malfunctions according to the American Heart Association. When the heart stops beating the blood supply to the brain and other vital organs is cut off and the person affected loses consciousness. The brain unlike other organs of the body has no reserve of oxygen, thus making it necessary for immediate help. Without immediate attention, death becomes imminent because there is no pulse, breathing and the loss of consciousness. A quick response of CPR ( Cardio-Pulmonary Resuscitation), treatment with a defibrillator or even compressions to the chest can improve survival until medical emergency help arrives. Quick response is necessary to prevent brain damage which can occur within 4-6 minutes. Call 911, they may talk you through necessary steps to keep the person alive until medical emergency help can relieve you. The unfortunate thing is that sometimes there may have been warning signs; such as dizziness, chest pain, shortness of breath, heart palpations, weakness or vomiting which were ignored. The heart has its own electrical system. The sinus node generates electrical impulses which flow through the heart. It modulates the heart rate and coordinates the pumping of blood through the heart and other parts of the body. Most cardiac arrest cases occur in people who have a history of Coronary Artery Disease. For a normal healthy person an irregular heart rhythm generally occurs from an outside source such as an electrical shock, trauma to the chest or complications from use of illegal drugs. Congestive Heart Failure: occurs when the heart cannot pump fast enough to supply the necessary blood and nutrients needed by the body. There is generally fluid retention in the lungs which causes shortness of breath, weakness and fatigue. Chronic congestive heart failure is also caused by long term high blood pressure, heart-valve problems, diabetes, chronic lung problems, obesity and previous heart attack. If the heart has to work too hard for a prolonged period of time it enlarges, but weakens. As the pumping decreases fluid increases, thus the term “drowning in your own fluids”.